Have you ever wondered if there are easier ways to get lab testing done than going to your Doctor? Well, there is and Health Testing Centers provides those options. I was fortunate enough to be able to do this review and offer you my opinions of what I found. I was given the testing for free in compensation for this post, but all opinions are mine and I only feature products and services that I would use myself. 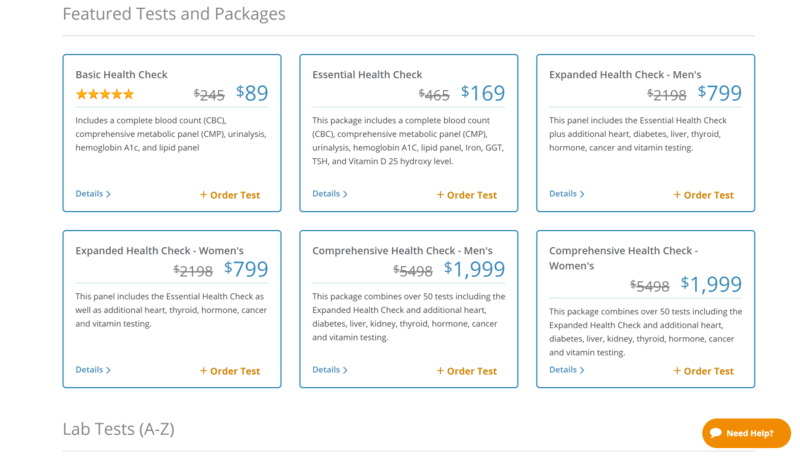 Health Testing Centers saves you hundreds of dollars by having lower prices because they don’t go through insurance companies. In addition to that, you don’t have to go to your doctor to order any of the tests. With over 3500 different locations where you can get tested plus testing panels that you can do yourself at home, you will have the freedom to get any test you need to be done when you want to do it. They use the largest FDA and CLIA approved labs in the country to get your results from. Some people don’t want their doctors or nurses to know about their problems, symptoms, or if they are being tested for Sexually Transmitted Diseases. People don’t want the insurance companies knowing what is going on as well because they are fearful that their coverage or costs might be affected. Sometimes people just like to play doctor and want to find out what is wrong on their own. Click on the picture above to save 10% on all the tests you order, use the code “medictom” at checkout. 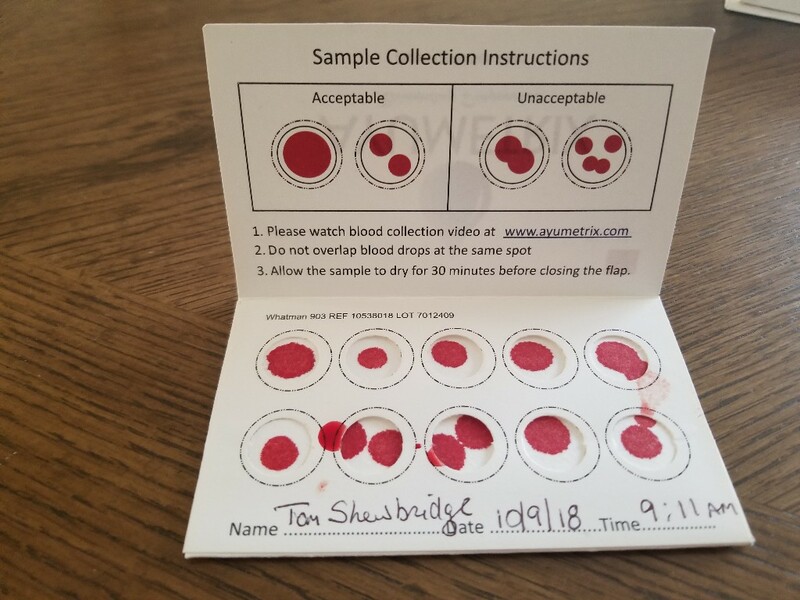 As a former 24-year Paramedic and Healthcare Professional, I have drawn thousands of tubes of blood for tests in my past. I was really good at it in my opinion. I never had anyone say I ever hurt them. But have you been somewhere where they kept poking you like a pin cushion? Do you want to go through that again? 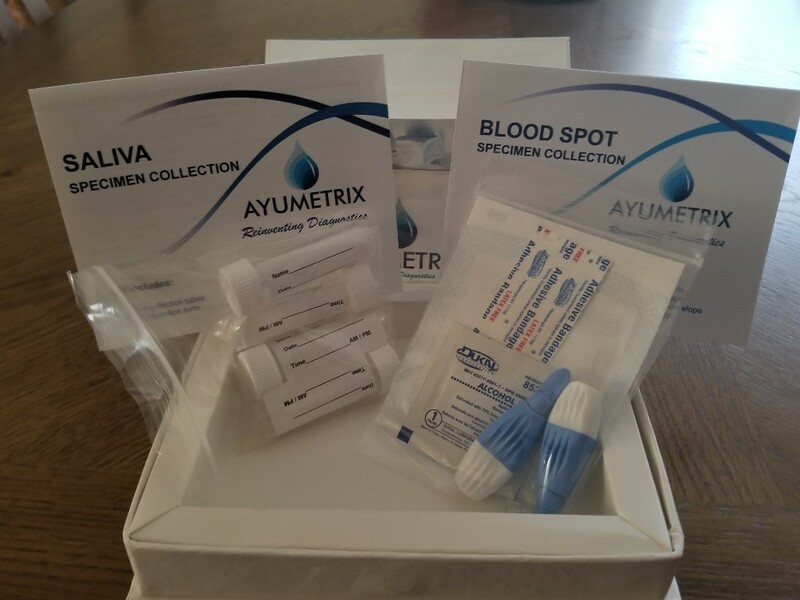 Consider doing one of the at-home test kits like I am reviewing right now. 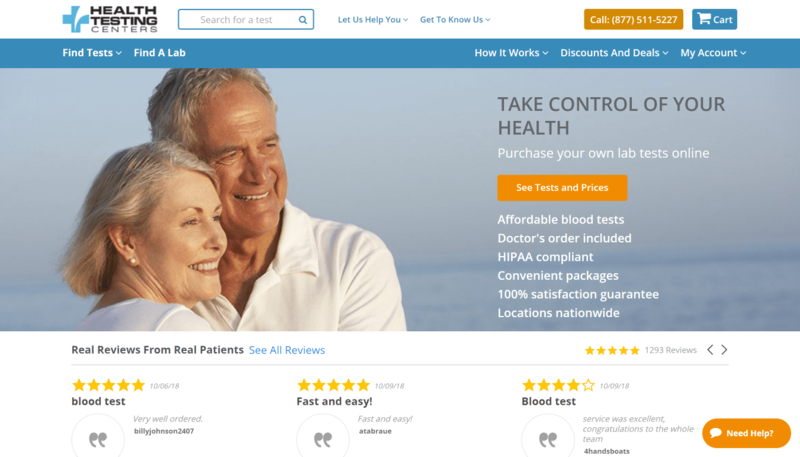 With this testing company, you have the option of going to a lab that is independent of a hospital or order one of their test at-home kits that you can do on your own and mail back in. 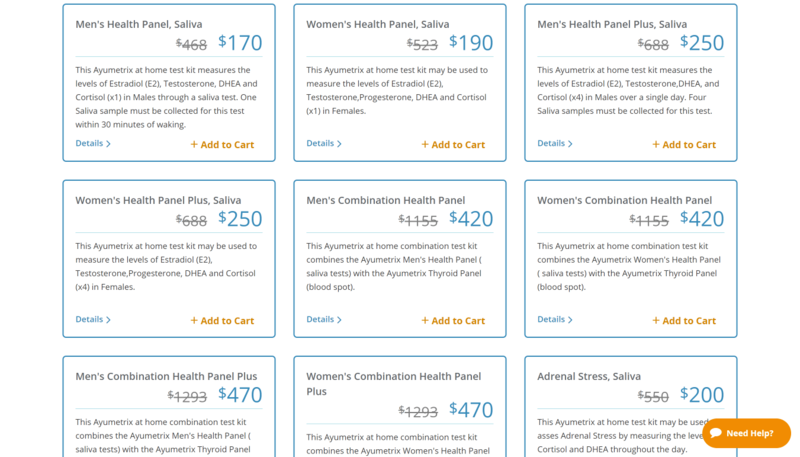 I chose to select the Men’s Combination Health Panel to have done. It all came in a package that has all the instructions you need to collect your samples and also instructions on how to mail it to the lab to have the results forwarded to you. 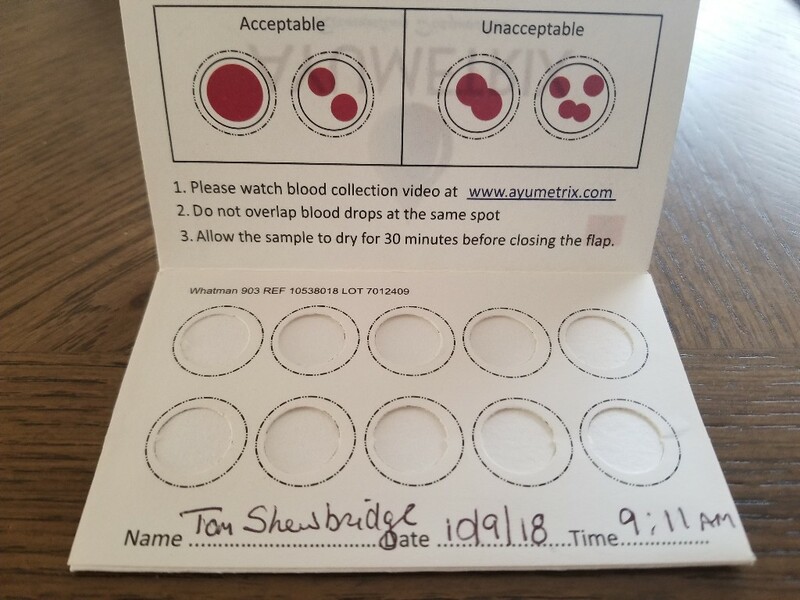 Followed the instructions to fill this card with my blood sample from a little stick of my finger. Here is what it looks like after the collection. It was really easy to do, and if you have further questions on how to do it, there are video instructions on their website on what to do as well. Part of the kit also included collecting saliva for certain tests, again this was easy to do as well, and they instruct you on how to best collect it and prepare it to be shipped. Everything was straightforward and easy to understand. The company is dedicated to your privacy and quick results of your testing. I will add an update to this article with the status of how long it took to get my results and how easy it was to access them, so stay tuned for that. Make sure you bookmark this article so you can come back to read what I have to share about that. *One thing I wanted to note, I found it difficult collecting as much saliva as the instructions said they need. I hope I provided enough because my mouth was getting so dry trying to get as much as they said. I hope what I sent was enough, I will find out soon I guess. Now, do you want to get some of your own testing done? Whether it be an STD Test, Prostate Testing, General Wellness or a Cancer Screening, Health Testing Centers have the tests you need to protect yourself. Ready to go order your own? 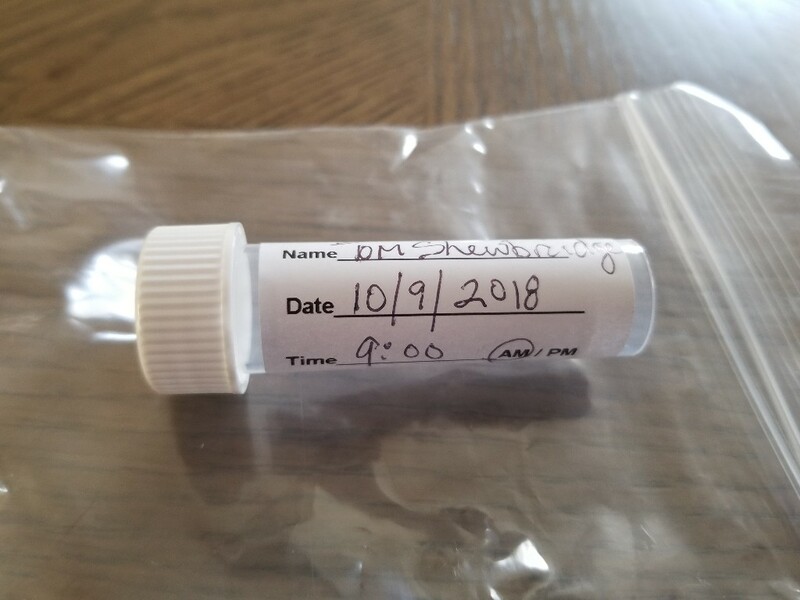 When you click here you will be given a chance to go to the website and save 10% off your testing when you use the promo code “medictom”. Great review. Does insurance pay or not. It would save on a doctors visit. I dont see myself doing this no, but others might especially for some of the tests. The bad part (IMHO) is if it did come back positive, you would have to have it redone to be treated. My DR is a test freak, she is on me like crazy, but I have to admit she is good. She is also reasonable. If she is saying say one test that is super high priced and another lower priced test can detect the same thing she will concede and do the lowest first and usually less invasive. These test would either give someone peace of mind or get them to a doctor. Thank you so much, Ellen. I do appreciate your sharing and comment. I think this appeals to people who might not have insurance. Or want certain tests to be private. I agree with some of what you said though, I think some things would be retested. But since they are FDA and CLIA approved labs, maybe not.